July 27, 2018, 2:00 p.m.
Did Russia interfere in the 2016 election? For half the public in the latest Economist/YouGov Poll the answer is yes. Even one in three Republicans agree. 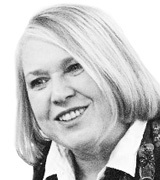 But the bigger question may be whether or not it made a difference. Republicans and Democrats agree that Russian President Vladimir Putin preferred presidential candidate in 2016 was Donald Trump, not Democratic nominee Hillary Clinton. One in three Republicans (compared with 49% overall) say Putin favored then-GOP nominee Trump, one in five think he supported Clinton, something only one in ten non-Republicans believe. 77% of those who see Russian interference say it was because the Russians wanted to help Donald Trump. But wanting an outcome and actually creating that outcome may be two different things. 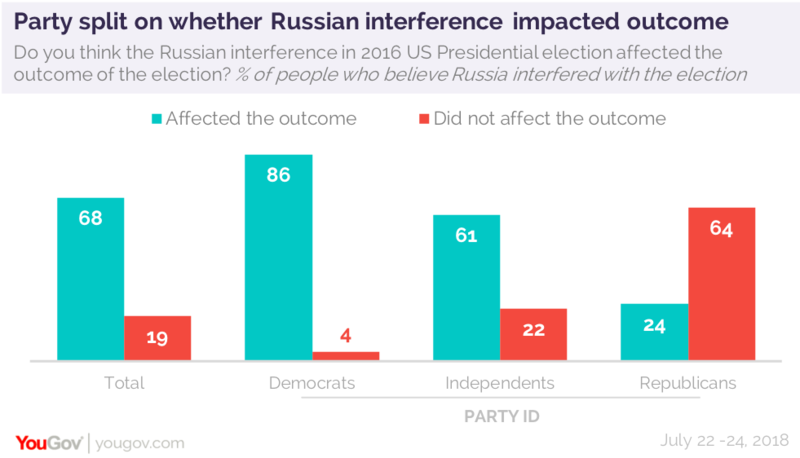 Two-thirds of those who saw interference think it affected the outcome, but those Republicans who say there was interference disagree. These questions illustrate the national division Special Counsel Robert Mueller’s investigation into Russian actions in the 2016 election faces: a combined 37% either say there was no interference or say there was but that it didn’t affect the outcome, while 40% say there was Russian interference and believe it did make a difference in the outcome. Americans narrowly agree that Russia did in fact spread fake news (53%-47%) and hacked Democratic National Committee emails (54%-45%) in order to help Donald Trump win. Whether or not President Trump believes Russia had a reason to interfere in the US election became a subject for debate after the press conference following the Trump-Putin summit: what did President Trump mean to say? Was there no reason why Russia “would” -- or “wouldn’t” -- interfere in the 2016 election? This raised questions about who the President believes more: Putin, who denied interfering, or US intelligence agencies, who say Russia did (and that there is interference taking place now in the 2018 contests). Americans don’t believe the President’s clarification. By two to one, they say the President believes Putin’s denial more than he believes US intelligence agencies, though Republicans say the opposite. And by 39% to 25%, American think President Trump really meant to say what he did at first during the press conference, that he saw no reason why “it would be Russia” who interfered in the election. The perception that the President accepts Putin’s claim of non-interference is reflected in how Americans look at the relationship between President Trump and President Putin. More believe Putin has influence on President Trump than say the opposite. Republicans see influence going in both directions: many say both men having at least “a little” influence on each other. Some suggest that Putin’s influence on the US President stems from information: as many think that Vladimir Putin has compromising material on Donald Trump than say he doesn’t. There are clear partisan differences on whether or not whatever Russia did or didn’t do in 2016 even matters to many: while nearly half the public overall say they are concerned about possible improper relations between the Trump campaign and Russia, three in four Republicans say it bothers them little or not at all. As for 2018, Democrats are looking back to President Barack Obama as the model for their Congressional candidates. By two to one they favor candidates like Obama over candidates like Vermont Senator Bernie Sanders. Republicans seem happy with what they have (and recent primary results indicate the same). By more than two to one, they prefer candidates more like Donald Trump than like former President George W. Bush. In the national aggregate Democrats are preferred for the US House 44% to 38% for Republicans among all registered voters. But many are undecided and national vote totals may not reflect the actual seat outcomes.